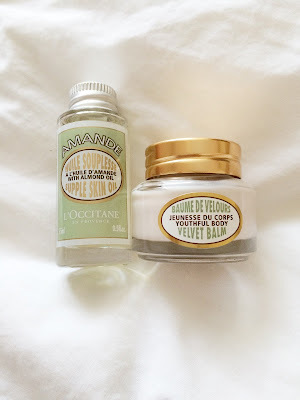 The other week I went to collect my free sample of the L’Occitane Almond supple skin oil (15ml) and Almond velvet balm, which was inside the August issue of the Instyle magazine. After reading into the benefits of almond oil, I knew I would be hooked. There are so many benefits to certain oils, from coconut oil (as discussed on here before), Argan oil, grape seed oil, castor oil and many more, its hard to stick to one. The almond oil is acquired from the almond seed and contains vitamins E, vitamin B2 and vitamin K, as well as nutrients like omega 6 and other essential minerals. In relation to the skin, the almond oil has benefits that would make you want to switch from your normal moisturiser. The study has shown that not only can it protect you from the sun, it can also reverse damages that may have already occurred! (Read more here) If that doesn't persuade you, the almond oil also nourishes the skin keeping your skin moisturised longer, improving your complexion and leaving your skin glowing. It also relieves itchy irritated skin and has the ability to reduce dark circles under the eye. Don't know about you but I'm converted and these are just some of the benefits for the skin alone.